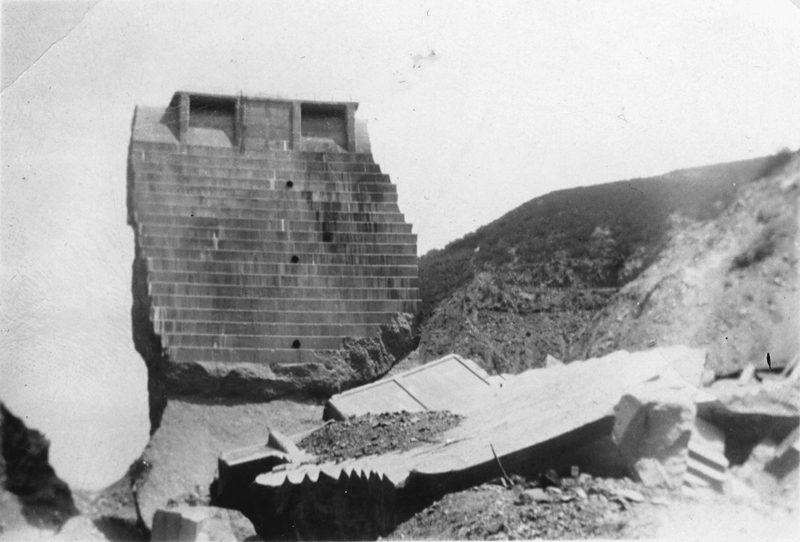 A section of the St. Francis Dam, known as the "tombstone" or the "monument," remained standing after the dam broke on the night of March 12, 1928. It was located 7.2 miles up San Francisquito Canyon Road from today's Copper Hill Drive in Santa Clarita. This north-facing photograph was shot by Hetta Laurena Carter a few weeks after the dam break. In front (south) of the tombstone is the section that had stood to the (viewer's) left of it. HC2805: 9600 dpi jpeg from original print.